With only four game modes you may think that this isn�t worth the buy. And, if you want an epic platformer, it isn�t. 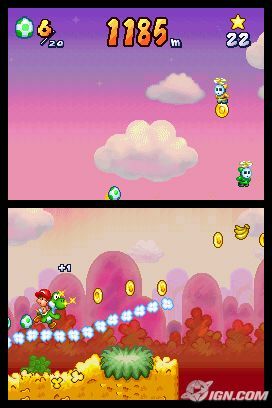 However, initial disappointments aside, Yoshi�s Touch & Go is one of the most addictive games on the DS. 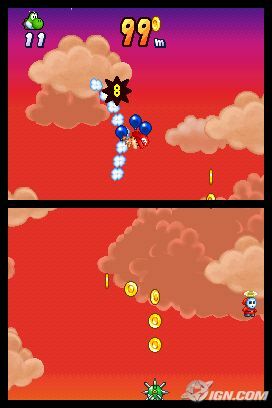 It�s a simple concept, really, in the first part of a level; you guide Baby Mario down the screen by drawing a path of clouds, while avoiding enemies. 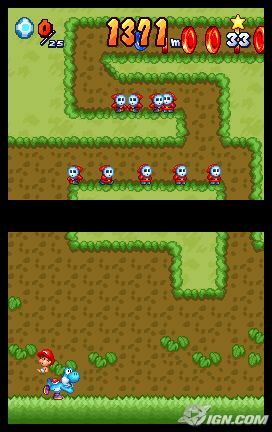 Guide Mario to the safety while collecting coins. More coins mean a better Yoshi. In the second part, Baby Mario rides Yoshi, who jumps when you touch him, and can shoot eggs. It�s here where the game mode differences really come to light. At first the game seems so simple, but over time you�ll see that you�ll have to develop a technique to beat those top scores. Although at some points in the game you�ll be concentrating on just staying alive, as one hit means death. Getting maximum points out of these cave sections is a real challenge. The dual screen has been put to brilliant use here- the game wouldn�t work without it. Maximising the potential of the touch screen here. Well done Nintendo. They�re nice and smooth, but nothing special. The tunes here are nice, but instantly forgettable. Uses the DS� features well, but it hardly pushes it. Immensely addictive, but if you get bored you probably won�t go back. The multiplayer is nice, but nothing special. An addictive little game this, and it pushes Nintendo�s innovation message. But it will still disappoint many. Page created in 0.0089 seconds.